UNITED: Understand Neighbors Integration Though European Dances - Stowarzyszenie Młodzieżowych Inicjatyw Twórczych "CREATOR"
We are happy to announce that SMIT "CREATOR" members were participating in the Youth Exchange called UNITED: Understand Neighbors Integration Though European Dances coordinated by organization ASAP Europe. The exchange was attended by 40 young people from European 8 countries: Italy (Asap Europe), Lithuania (VsI "Jaunimo epicentras), Poland (Stowarzyszenie Młodzieżowych Inicjatyw Twórczych "CREATOR"), Greece (Interalia e Youth Horizons), Macedonia (Asocijacija za napredok, edukacija i lobiranje -PEL), Croatia (Civilna, edukativna i transparentna platforma - CET), Spain (AC Amics de la Biblioteca de la Fonteta) and Romania (Asociatia SUPER TINERI -ASIRYS). The age was between 18 and 25 years old and most of them participated for the first time to a project under the Erasmus+ program. The aim of the project was to support the mutual knowledge and understanding of the young participants about different cultures and the rich heritage of traditional dances existing in Europe. During the week, the participants were involved in group activities, energizers, role play and workshops according to the non-formal education principles, recommended by the European Commission. The focus of the exchange was dance meant as an instrument to break down prejudices and stereotypes and creating relationships among young people. It was an honor to represent SMIT "CREATOR" during the project UNITED and be a participant of the Polish team. I am particularly happy that I got to meet Basia, our great team leader, and other participants - Adela, Asia and Justyna. Even though we have diverse personalities and we come from different backgrounds, we managed to create strong team which was really important as we had to work together to prepare a workshop and an intercultural evening. I would like to also pass my thanks to the organizers from ASAP who prepared a very good project. We spent a great deal of our time in a meeting room in a hotel, where most of the activities took place. Each country was supposed to prepare an intercultural evening and a 90-minute-long workshop. It was fun and educational to participate in intercultural evenings during which we in a way had a chance to taste different cultures through some activities, games and traditional food of the countries. A bigger deal during a project were the workshops. During workshops, we got immersed in different cultures through various ways, mostly dance. participants. Everything went really well. To conclude, I learned a lot about other cultures thanks to the project. I went back home being able to dance some moves of other European dances. I also met some nice people whom I want to stay in touch with. We really got "united" in the course of the project. Thanks to SMIT "CREATOR" I had a great opportunity to take part in Youth Exchange "UNITED - Understand Neighbors Integration Through European Dances". From 16 to 24th of February 40 participants from Poland, Lithuania, Croatia, Romania, Macedonia, Greece, Spain and Italy stayed in a beautiful Italian town Fasano, discussing about social inclusion, stereotypes, sense of belonging, discovering our cultures and traditions, sharing national and regional dances. Every day I was looking forward to attend the new workshop and learn more about my European neighbors. 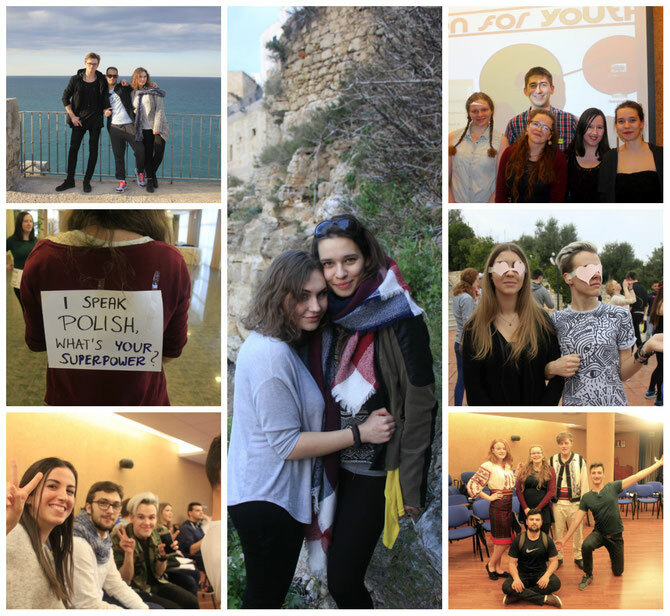 The project was an unforgettable experience and occasion to meet inspiring people from different parts of Europe. It will stay in my mind for long. Project called ,,UNITED” took place between 16th and 24th February 2016 in Fasano, Italy. During these eight days we tried to Understand Neighbors Integration Through the European Dances. Every day five people from one country were teaching us their national dance or dances. There were egiht workshops with dances from: Macedonia, Croatia, Italy, Lithuania, Spain, Romania, Greece and Poland. Not only we danced, but also learnt each other cultures trough games, singing and, of course, talking in the free time. This project was also a chance to taste national specialities from each country during intercultural evenings. For me, UNITED was a great experience about diversity and chance to meet amazing people from different countries and living in various culture. Training for customer support are many types which can be beneficial for many types, types of sharing. We are providing the best sales training in New Zealand at prominent cost. If you are drawn to complementary and alternative medicine, you are not alone. Alternative medicine colleges are growing in demand as "36 percent of U.S. adults aged 18 years and over use some form of complementary and alternative medicine. In pharmaceutical licensing, blockbusters and late-stage opportunities are becoming harder to find. A realistic alternative is to focus on innovative earlier-stage and niche opportunities. If the licensing deal and subsequent pharmaceutical development are done right, these products can lead to rewarding outcomes for the pharma licensee, for the biotech licensor, and for the patients that ultimately benefit from new therapy options. Settees are enormous and unattractive. To tidy them properly you'll have to pull through the cinema seat cushions not to mention vacuum all inch not to mention brush separate any crumbs and various other bits which happen to have fallen right behind and collected in your corners and following the edges.